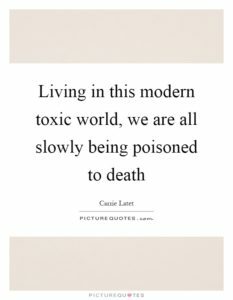 We are all slowly dying, and it’s the world that we live in that is killing us! Any reasonable person is going to do what they can to keep themselves (and their family) safe. 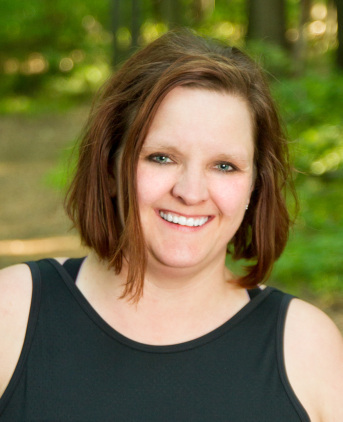 Looking both ways before crossing the street, keeping cleaning products away from children, smoke alarms and carbon monoxide detectors in our home, not eating spoiled food… the list goes on. 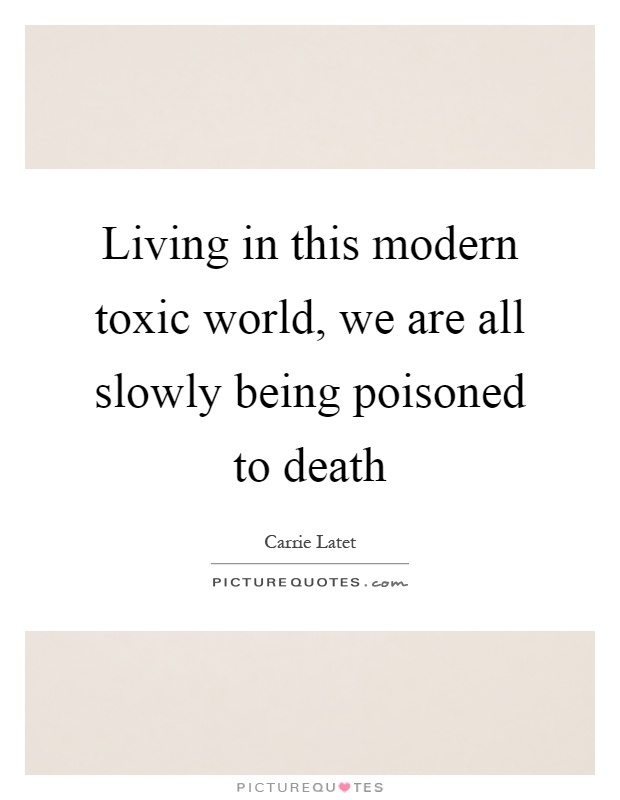 However, there is an even bigger killer out there that we are subjecting ourselves to each and every day. And no, I am not talking about any disease in particular or accidents. It’s the world that we live in! Weeds are getting smarter. They are actually becoming resistant to many of the pesticide etc that farmer are using, so we are continually coming up with new products to kill off these weeds in the farmers fields. And these pesticides are in turn being introduced into the foods that are being grown… and then we are eating! A growing number of “foods” in the grocery store are really not even food – they are produced in factories using a variety of man-made products and then flavored to taste like your favorite dinner. Same goes for an alarming number of beauty products (lotions, toothpaste and more). All of these combined are slowly overtaking us and, if they don’t kill us, will lead to an even bigger increase in sickness, disease and more. No, I am not suggesting that you live in a bubble (although some days I think that might be the safest place!) 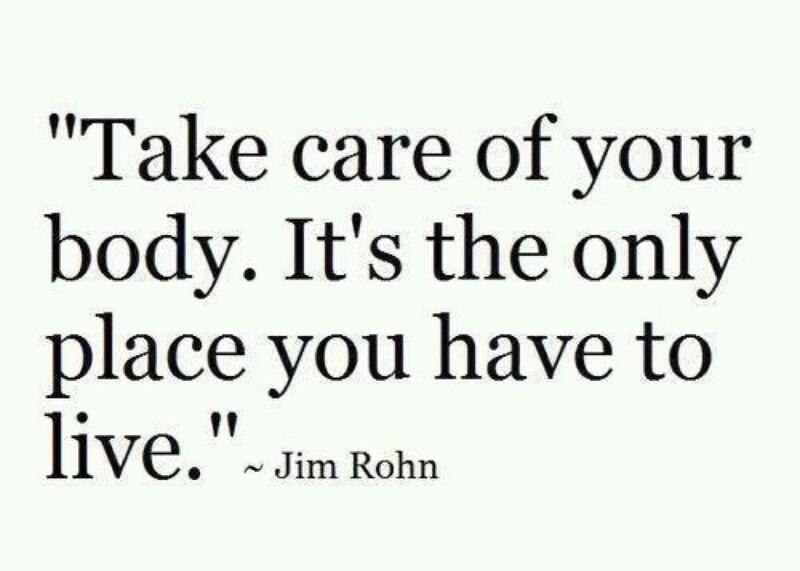 but there are many things that you can do to help protect yourself and your family! Pay attention to what we are feeding our bodies! It’s not all just about calories in vs calories out. We need to stop and think about chemicals in vs chemicals out. What is really in the foods that you eat? What is in that bottled “natural” juice or fruit smoothie that you grabbed at the convenience store? Can you actually pronounce everything that is in that prepackaged, pre-portioned frozen dinner that is in your freezer? And even if you can pronounce it, do you know what it is? These are just some of the questions that we need to stop and ask ourselves. Many of the food companies, and even the FDA, will say that these chemicals are ok in small quantities. Really? I don’t think that I want to drink even a small quantity of antifreeze! 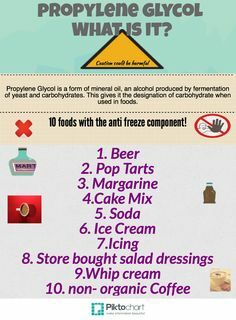 BUT, Propylene glycol, a colorless, odorless liquid, is one of the chemicals that makes up antifreeze and can be found in many things, from plastics and paint to Pop-tarts, hot sauces, Fireball Whiskey and ice cream. “The FDA acknowledges that propylene glycol can cause kidney damage when consumed in large doses and skin irritation when it comes in direct contact with flesh. In the U.S., products can contain five grams of propylene glycol for every kilogram of body weight. European formulas, however, can only contain .1 gram per kilogram. Why is it that they FDA would allow this? 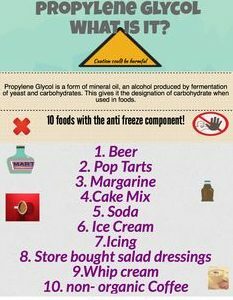 Other countries have banned selling food products that contain Propylene Gycol, but why does the U.S. still allow it?!?! No matter how small of an amount is in a product, if you are consuming 15 of these products that contain propylene glycol, over time, how much of it is really going through your body? This is just one example. There are hundreds more out there, similar to this. It is our responsibility to stop and take a look at what we are really eating. Take the time to read food labels and really understand what is being put into your body! Eat more whole, real food and less of the processed foods that are everywhere! We are all busy, but sometimes taking a little time to cook a meal at home (yes, from scratch just like your grandmother used to do!) from fresh real ingredients can make a huge difference! 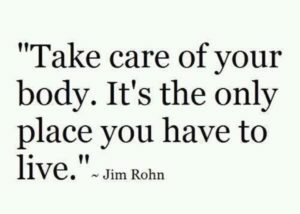 You only have one body, take care of it and it will take care of you! Together you can live a long, happy and healthy life! Love this and terrified by this. We try around here, we really do, but this reminds me it’s time to step up our game. I was just at a local store that had the most amazing bread made right there and yup, she said it would only stay fresh for 3 – 4 DAYS, not weeks. Makes you wonder. LOVE being able to find wholesome fresh foods like that! Thankfully we have a local indoor farmers market during the winter months so that I can find fresh stuff like this from small local farms etc! This is a great post. I’ve been seeing more and more GMO products well at least no labeled as being so. I think it’s so messed up. I’m like what can we eat???? The struggle is real! Most days, we can’t trust labeling because ther eis no consistency! One day, I hope we can get there, until then we need to stay on our game, read labels and educate people on what they really are eating when they buy all of the over processed foods that take up most of our grocery stores. I am a huge label reader. Also, since our family owns Pete and Gerry’s Organic Eggs we work hard to choose as much organic food as the budget will allow. Our food systems are pretty scary! I love it! I wish you lived closer so I could but my eggs from you! I too read labels all the time – which is probably part of the reason it takes me so long to get my grocery shopping done some weeks!